Zakariah Davis and his wife Mia are among those infected with an alien virus that vastly prolongs human life, and their blood has become a black-market staple due to its rejuvenating effects. Their teenage son Rix does not carry the Eternal virus, and Zakariah is consumed by the search for an “activated sample” with which to inoculate him. Living in a secret community of the infected, Zakariah is a legend among runners — his brain surgically wired for direct connection to the global computer system where economic activity is conducted by avatars in virtual cyberspace. A deal turns sour and Zakariah narrowly escapes as a fugitive, separated from his family. He is trapped by a power-group known as the Eternal Research Institute, and travels offplanet through a commercial wormhole along with his new business partner and surgical cyber-twin, Helena Sharp, who is seeking the Source of the virus for her own purposes. In the Cromeus colonies, on the other side of time and space, Zakariah will risk everything to give his son Eternal life. 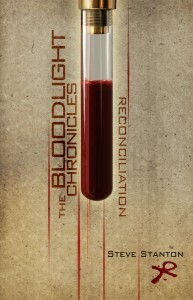 The Bloodlight Chronicles: Reconciliation is now available from ECW Press.